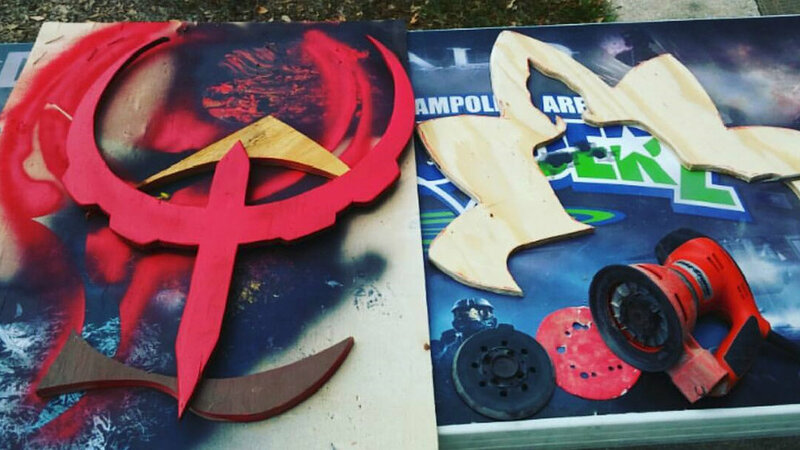 I played a lot of Quake 3 Arena in college back in St. Petersburg, Russia and always liked the logo, plus I wanted to try out some textured spray paint for my future projects, so I got busy. I was doing a couple other projects alongside - like the little buddha. After cutting out the shape which was pretty easy out of a piece of scrap plywood I found laying around when walking my dog - sprayed it plain red first. And it actually came out awesome. Unfortunately, I managed to drop the entire thing onto the concrete floor and one of the horns broke off. I tried cutting it down, but the proportions were all wrong - so I just scrapped it. RIP, Quake Logo. It was a fun, pretty easy project with a sad ending. Valuable experience was learned, however, so not all was lost. I've used the painting technique quite a few times since with solid results.